One of the essential pillars for us is quality, both in our products and our services. This is, without no doubt, the engine that moves us day by day. Offering a quality product that satisfies our customers’ needs, creating an organization, beneficial for our personnel, that allows our team to be satisfied and proud to belong to this company and, in addition, collaborating with our environment, are three of the key points for us. Being aware of the importance of quality in our activity, for a long time in CEG Innova we have our quality management system certified in the ISO 9001 standard. ISO 9001 is an international reference standard that is applied to quality management systems (QMS) and that join together all the elements of quality management that a company must have in order to have an effective system in terms of quality. Recently, this standard has been updated and the new standard ISO 9001:2015 promotes the identification of risks and opportunities that can affect, both negatively and positively, in the achievement of objectives and results that have been planned and that the company has set as objectives. In addition, this review has given more importance to the role of leadership and the work of management to promote continuous improvement of the quality management system. 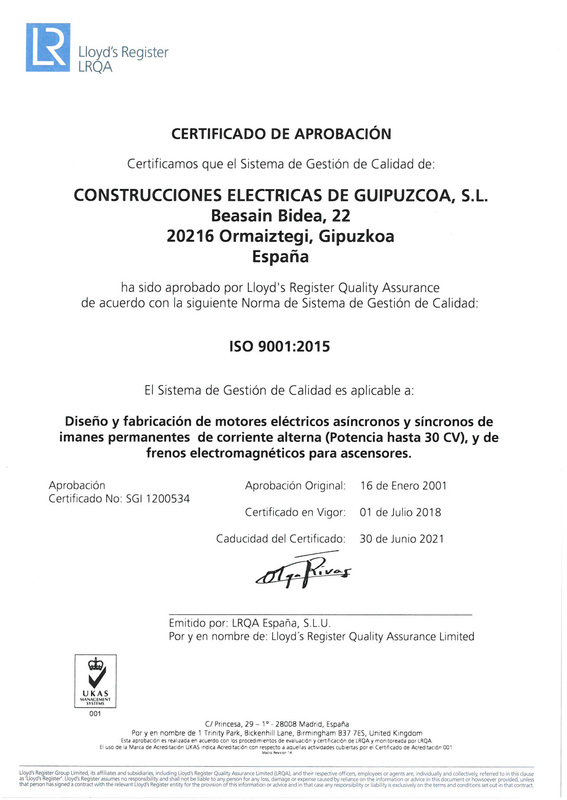 The Management of CEG Innova is aware that to achieve our strategic company vision, it is essential to implement the Quality Management System following the UNE-EN-ISO 9001:2015 Standard, as well as to comply with the requirements of the directive and regulations in force with regards to elevators at all times. There is a real commitment from the Direction to fulfil the Strategic Plan and the implantation and Continuous Improvement of the Quality Management System, System of Management of the Quality. All of this has been reflected in our Quality Policy. From this quality approach to which we are committed, we will strive every single day so that the good work of the company can satisfy all interested parties. For this reason, we have recently renewed our quality certificate in accordance with the most current regulations. For some few months an intense and deep period of reflection was carried out with great results. We learnt a lot and we got new points of view which led us to stablish new procedures and actions which will enable us to continue improving, undoubtedly our objective for more than 50 years.